Phillyweather.net: NOAA Winter Outlook -- Coin Flip! NOAA Winter Outlook -- Coin Flip! 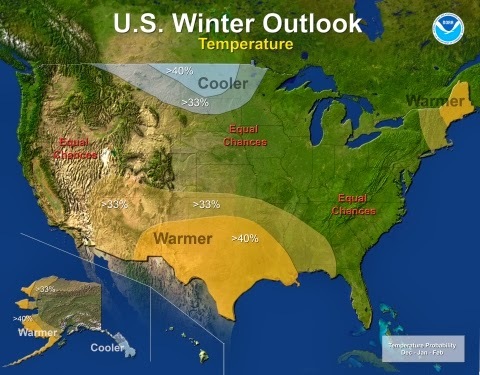 NOAA's winter outlook was released on Thursday morning. Their outlooks, as you are likely aware, are different in the sense that they don't get into using "normal" or "average" but instead use the wonderfully unique "equal chances" as a way to describe whether temperatures will end up milder or colder than average for the course of winter. That's exactly where we are -- for both temperatures...and precipitation. Their outlook only paints one pocket of cold for the balance of winter -- the Northern Plains, with a swath of warmth across Texas, the Southwest, and also across eastern parts of New England. For precipitation, they feel dry conditions or drought should develop across the Desert Southwest and across the Southeast during the course of winter, with below average precipitation expected. The only areas with above average precipitation are anticipated to be the Northern Rockies (Montana, specifically). There's no big driver (Nino, Nina) in the atmospheric and oceanic patterns this year. Without the Nino and Nina bus to drive winter along, NOAA is saying this winter outlook is a bit more of a challenge than past years. Equal chances for us for warmth and chill...equal chances for above and below normal precipitation. Sounds like a coin flip type of winter in their eyes.